Amazed would sum up my reaction to the the Coastal Maine Botanical Gardens, a paradise carved out of a Maine wilderness. 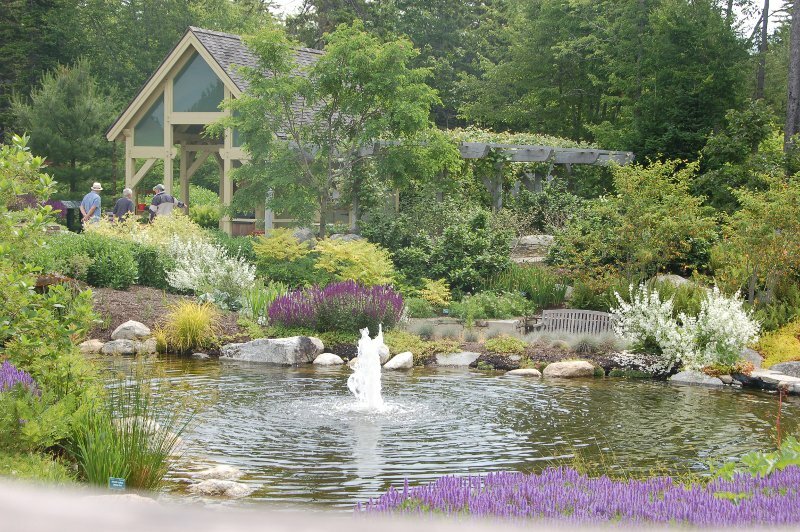 Just a mile from Boothbay, the area residents and those who live close by can visit easily throughout the year and watch the changing of the seasons in the gardens. I envy them no end! It must have been a monumental task to create these gardens because it’s a daily effort not only to maintain the gardens and create new areas, but to keep the surrounding woods from encroaching on what’s here. 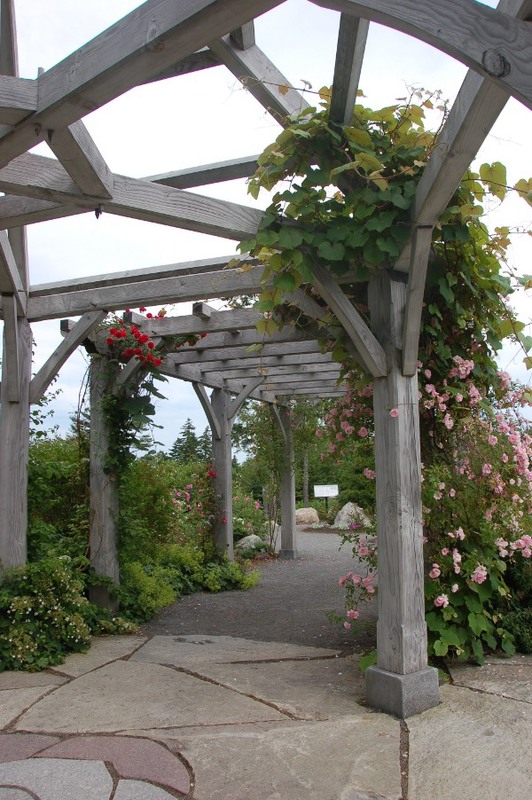 The idea for the Coastal Maine Botanical Gardens was born in 1991 when a group of mid-coast Maine residents felt that Maine and northern New England needed a botanical garden. 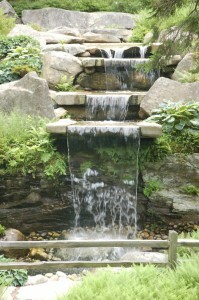 Sixteen years later, after extensive planning, building, and planting, the botanical garden opened in 2007. 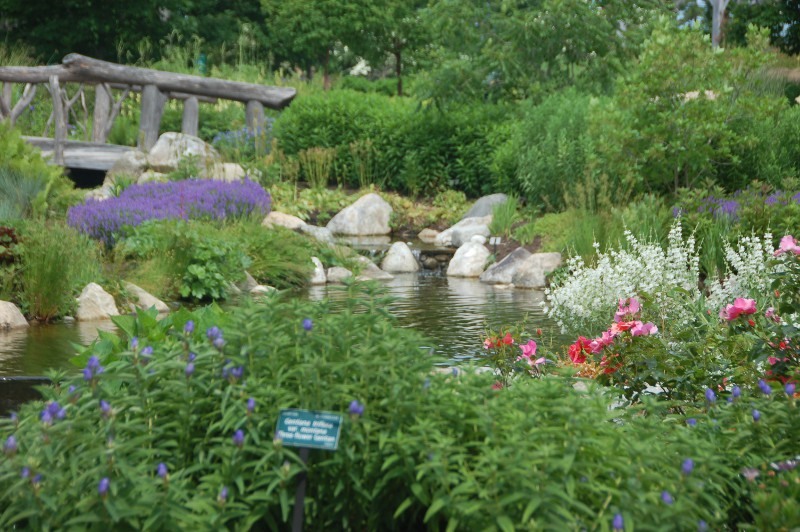 It is one of the major botanical gardens in the country and one of Maine’s top attractions. It comprises 248 acres with over half purchased (with some directors using their homes as collateral!) and half donated. With nearly a mile of tidal shore frontage, it is one of the few waterfront botanical gardens in the country. 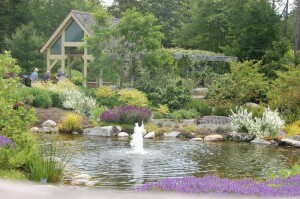 Renowned landscape architects from Maine, such as Bruce John Riddell of Bar Harbor, and elsewhere created the master plan and designed the gardens. The Maine cottage-style visitor center built in 2007 was designed by Quinn Evans Architects from Washington, D.C. Since the opening, the Lerner Garden of the Five Senses and the Bibby and Harold Alfond Children’s Garden have been added, and the Haney Hillside Garden has been renovated because of changing light and drainage conditions. In 2011, the Bosarge Family Education Center, considered the greenest building in Maine and very energy efficient, opened and provides a venue for educational activities for the public and office space for staff. William Cullina became director in August 2011. He is a renowned horticulturalist, the author of five books, and a popular speaker. 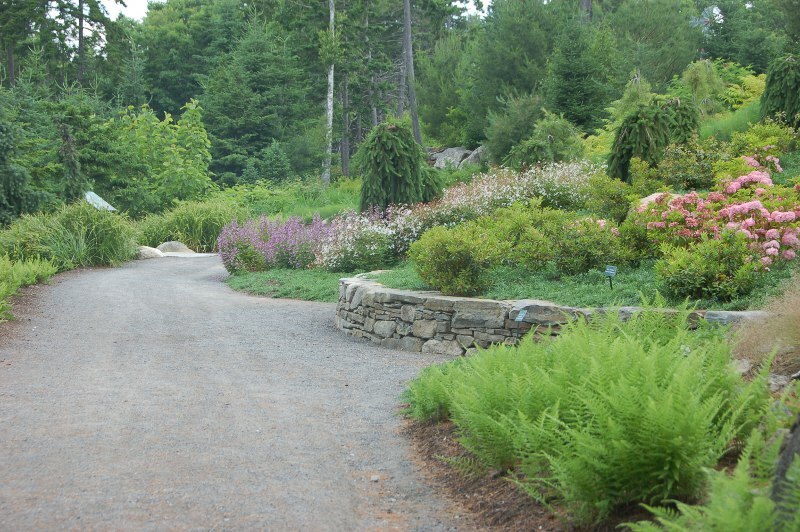 Financially, the botanical gardens has depended on the generosity of donors – individuals, foundations, and the state of Maine – and has not been disappointed. It received a challenge grant from the Kresge Foundation of $600,000 in 2005, which was met it in 2006, and since then has received several other challenges from donors. With a goal of $24.5 million to be met by the end of 2012, they have already received most it, which has been used to construct several buildings, including the education and visitor centers, and create most of the gardens. Besides a dedicated staff, the gardens rely a great deal on the support of volunteers. I believe there are about 600 volunteers who work in just about every aspect of running the gardens from working in the visitor and educations centers, planting and weeding in the gardens to driving carts and leading tours. I had the opportunity to speak with volunteers driving the carts and they are very enthusiastic and committed to the botanical gardens. It’s easy to see why. Besides getting to work in a beautiful environment, the botanical gardens is a very well run organization, which makes working here a pleasure and very gratifying. There are free docent-led walking tours every Thursday and Saturday at 11:00 and 1:00 with no reservations required. There is also a shuttle service to make it easier to get between gardens. For those who might otherwise not be able to get to certain areas, the botanical gardens offer docent-led cart tours twice a day. But these need to be reserved at least a week in advance. I made the mistake of not doing so and am sure I missed out on some interesting information. Because I’m recovering from some medical treatment, the use of a wheelchair was going to make it more enjoyable for me to see all the gardens. The visitor center can provide various devices, such as wheelchairs and mobility scooters, for those who need it and provide ample information on getting around. The staff at the visitor center and the drivers of the shuttle service went out of their way to assist my husband and me. Roses: the fuchsia-red Double Knock Out and Kashmir Roses, pink All the Rage Rose, creamy ivory-yellow Macy’s Pride Rose, dark salmon-pink Patriot Dream Rose, and the light Yellow Brick Road Rose. Lilies: Golden Stargazer Orienpet Lily with its soft pink color and frilly stamens, and the Star Gazer Oriental Lily in eye-popping pink and white. Peonies: Pastel Sunrise Japanese Peony’s soft pink petals and yellow stamens, and the yellow Bartzella. The Maine Botanical Gardens’ website www.MaineGardens.org has a list of what’s in bloom each month as well as a plethora of other information on year-round events, workshops, and anything you might need to know for your visit. We left the visitor center and headed for the Lerner Garden nearby. Opened in 2008, the Lerner Garden of the Five Senses goes beyond the visual and encourages the visitor to experience the garden through the other senses as well. And it’s designed so that all can enjoy it. Being in a wheelchair, I got to experience having plants at eye level. My husband easily wheeled me along the stone paved path with a border of fragrant roses, mock orange, and other perennials on one side and a three foot high stone wall border on the other with a variety of colorful and fragrant plants such as brilliant pink oriental lilies with fragrant lavender and Caradonna salvia with its striking tall purple spikes. It was an unusual experience for me to be sitting while seeing and smelling plants at eye level. Next we came upon free standing wall gardens of green plants of various textures with bright blue lobelia meant to be felt and smelled as well as seen. These wall gardens grow plants hydroponically and can grow most any plant except root vegetables. This led to another curved path lined with eye-level stone wall beds, this time meant for tasting. There were lettuces and herbs, such as chives, along with interesting perennials such as the nodding wild onion with its pretty pink blooms. Our senses were titillated yet again with another free standing wall garden area of red and white begonias, a grass so soft to touch, and red and green clover plants in eye-catching patterns. We continued down the path lined with yellow roses, heuchera, and salvia. Looking to our right, it then became a scene out of Monet’s garden complete with an arched wooden bridge over a pond lined with purple gentian, pink All the Rage roses, white speedwell, and May Night salvia – a combination that is a feast for the eyes. There were benches throughout the garden to sit and take in all the sights and sounds. We continued down the path of Star Gazer oriental lilies, Caradonna salvia, yellow and All the Rage pink roses to enter the reflexology labyrinth whose beds were filled with drifts of white speedwell. Here a sign invited us to take off our shoes and feel the smooth stones under our feet. A path lined with roses, salvia, and the like led to a part of the pond with a fountain of water to add to the sounds of birds and rustling plants in the breeze. We continued around the pond to an area with beautiful pink water lilies. The scenes at every turn were out of a storybook garden. From here, we easily followed the way passing some pink and lilac fairy primrose and yellow foxglove to the Slater Forest Pond where we found some azaleas still with pink blooms. This forest pond garden features plants native to Maine such as lady’s slipper, jack-in-the-pulpit, and solomon’s seal as well as a wide variety of water loving plants and grasses. Because we had so much more to see, we didn’t spend as much time here as it merited. It would have been lovely to just sit and take in all that the senses will allow. A carpet of yellow evening primrose and white flowering Chinese dogwoods led us through the last pond area and into the Rose & Perennial Garden. We followed the path made of unique slabs of stone to the star of this show: an arbor flanked by two pergolas. 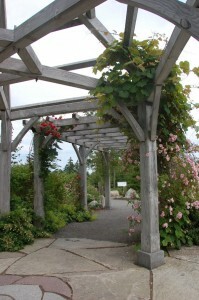 The brilliant fuchsia red Radtko and white Meicoublan roses led us to the arbor where pink climbing roses and purple clematis adorned the corners connecting to the pergolas. Look down and you see the face of a fellow pleased with life carved out of a boulder by William Jacobs. 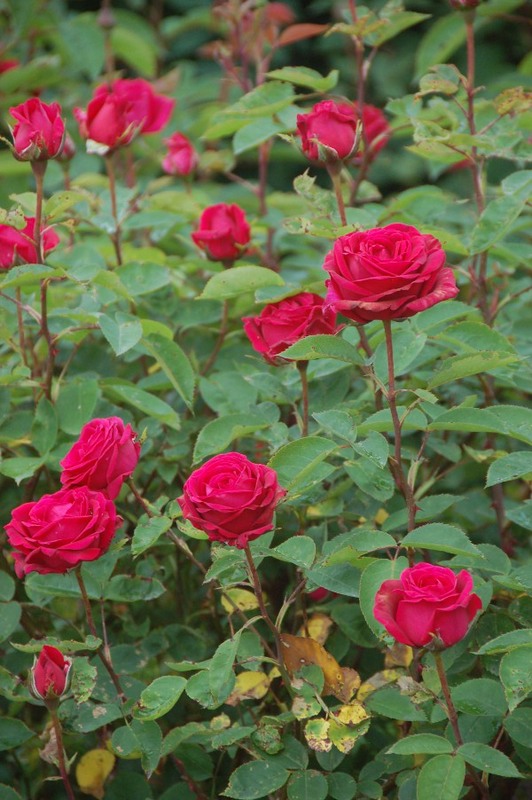 Of course, there were plenty of other roses in bloom to enjoy such as the Oso Easy Peachy Cream, Yellow Brick Road, and Autumn Sunset. And a wide variety of perennials such as blue flowering delphiniums and purple speedwell. We took the shuttle bus cart to these two gardens. 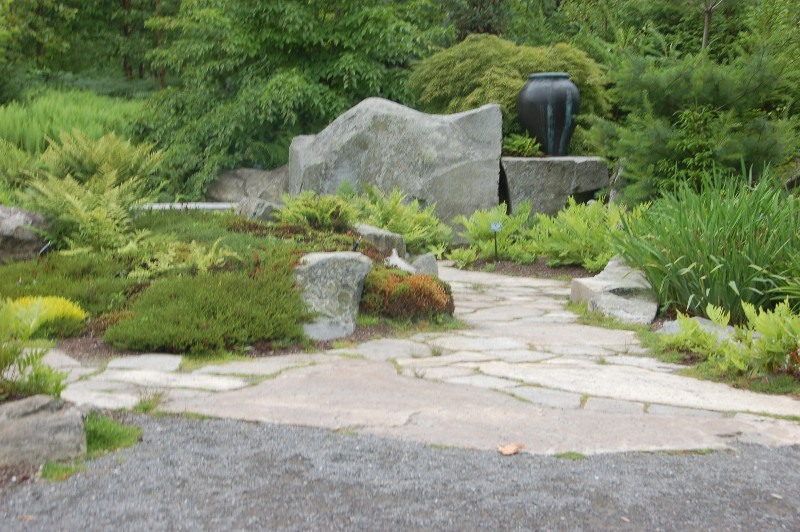 First was the Haney Hillside Garden, which is in a wooded area with a gentle sloping path lined with evergreens, rhododendrons, mountain laurel, perennial salvia and other plants. A very spiky porcupine sculpture by Wendy Klemperer made me do a double take. The mountain laurels were in bloom with its cluster of star-like blossoms. 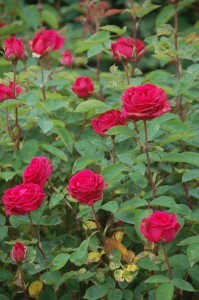 Especially striking was the deep fuchsia red of Keepsake. Did you know that it’s also known as Spoonwood because the Native Americans made spoons out of it? It’s also Pennsylvania’s state flower. Renovation of the Hillside garden was started in 2010 and reopened in June of 2011 with a recirculating bog pond and stone walls enclosing new plantings throughout the garden to prevent erosion. The gently sloping wide path led to the Moss Landing. This is a circular area paved with flagstones and features interesting rock formations with the black Lunaform Urn adding a focal point to the area. Being in the woods, the plants here are primarily ferns, mosses, and mountain laurel. Following the path out, we passed the dazzling chiseled orb by Henry Richardson, and continued on to the path leading to the Vayo Meditation Garden. Near the ocean front, this circular area features granite stone formations as well as basin sculptures by David Holmes. These basins are like mini reflecting pools with the center area of each carved out and filled with water. With the gentle sound of the ocean nearby and rustling of a breeze through the trees, it would have been nice to just rest here. But, alas, we needed to move on. We took the shuttle bus cart from here to the Giles Rhododendron Garden. If I had been able enough, I would have loved to have walked the nearby Shoreland Trail that follows the tidal Black River and features native plants and trees. There are coves and waterfalls to enjoy as well. At this garden, the rhododendrons were just past blooming with a few left with blossoms. But there were other plants to enjoy such as the Black Lace Elderberry with its light pink blossoms contrasting with purple black dark fine foliage. This area was the first garden in the botanical gardens and blends seamlessly with the surrounding woods. The dramatic stonework and waterfalls are focal points here, especially when the rhododendrons are not in bloom. At the entrance to the children’s garden is a listing of events for the day. This day there was story hour at 11:00, a chicken feeding at 12:30, and a discovery activity at the seagull pavilion at 2:00. Kids are encouraged to engage immediately with a maze path paved with stones and the bench swings nearby (or for the parents to enjoy while watching). Further on to the left, we were greeted to the greenhouse area by a pair of huge garden watering cans filled with shovels, hoes, and rakes. 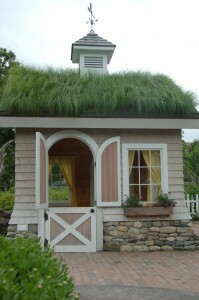 There’s a vegetable garden with plants growing even on the roof of a garden shed. We peeked into the story barn that invites you to enter and browse through books while waiting for story time. A little further on, clothes were drying on the line near the playhouse with grass growing on the roof. It was on to Blueberry Pond where kids can enjoy all sorts of activities such as walking on the giant stepping stones on the shore, rowing a boat, and other activities on the dock. Further on, there’s a tree house perhaps like out of Robinson Crusoe. If I were a kid, I’d be in heaven here. Everything has the child’s perspective in mind and I can imagine them running from one place to another running, jumping, touching, and screaming with delight. We didn’t see all the areas of the botanical gardens, such as the Shoreline Trail and the Fairy Village, or have enough time to truly take in all that the gardens had to offer. And I would loved to have taken a tour and hear interesting stories about this wonderful piece of paradise. It will be well worth a return trip. 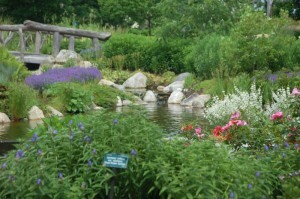 If you are in Maine, the Coastal Maine Botanical Gardens are a must see. You don’t have to be a garden enthusiast to enjoy the beauty here. There is something for everyone to enjoy! And don’t forget to check out their website www.MaineGardens.org.